This PE sheet was designed to be used with the recent issue BF-109F by AZ Models. I took on this review with the understanding that because I didn't have access to the AZ kit, I would use another BF-109F kit. Unfortunately, the only Bf-109F kit I had was an old Frog kit, so I used that. In reality, it didn't turn out too badly, considering the antiquity of the Frog issue, sometime in the late sixties. 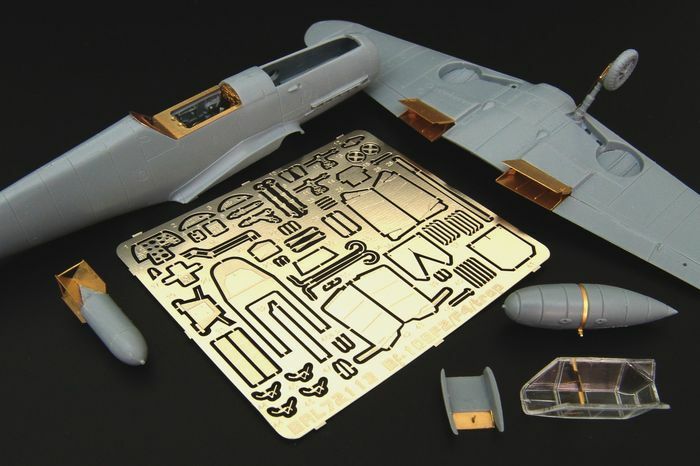 This accessory unit consists of a small brass sheet of parts intended to superdetail the AZ Bf-109F-2 and Bf-109F-4 kit. A detailed set of instructions is also provided, along with a clear plastic set of instruments for the instrument panel. I would advise leaving the canopy open on this model if you want the cockpit interior to be visible, as a good part of this sheet consists of cockpit details. This is difficult to do with the Frog kit. Other features of this set include fins for the bomb, facings for the radiators and oil cooler, and some landing gear parts. One of the highlights is a set of wing radiators, including the top and bottom sections which need to replace that section of the kit wing. This includes the rear radiator face, the top section, the bottom section, and all interior ribs and other parts. Unlike flaps, which are usually left retracted while the airplane is on the ground, the radiators are shown in the open position in most photos I have of Bf-109's, so it is appropriate to leave them open on the model. This, I think, is probably the best feature of this set. The instructions are printed on a half sheet of paper and consist mainly of a very detailed set of drawings showing how the parts are to be assembled. One problem I had was that there was no indication on the instructions as to the colors required, so I had to use other references. However, this information might be contained in the instructions for the AZ kit, but it still would probably be helpful to have this information available. The PE sheet itself is unpainted, so all of the parts have to be painted before assembly. Some of the instructions are not very clear on assembly, but then, it probably works very well on the AZ kit, although I had some problems with the Frog kit. Assembly is pretty straightforward, although some of the parts are VERY small, and some kind of magnification is certainly recommended, especially on the cockpit details. I used a set of pointed tweezers and superglue to attach most of the parts, and this worked out fine. The small parts are easy to lose, so be careful separating them from the sheet. One problem I had was smoothing the surface of the metal sheet which formed to the upper portion of the radiator. I used my usual automotive Bondo, and it seemed impossible to get the putty to stick to small sections of the metal surface. I got close, though. I used a set of old Microscale decals for the national markings and the markings of Heinz Bar's Bf-109F-4 used in Italy in 1942. For super detailing an F model Bf-109, this is an excellent product. I would assume that it would also work for some of the other Bf-109G and Bf-109K kits on the market, such as Hasegawa, Heller, Airfix, and Revell-Germany, and probably on others as well, as there have been many kits of the Bf-109 issued by various manufacturers over the years. This one is worth getting. Thanks to IPMS USA and Brengun for providing to me this fine accessory to review.